Deep Purple - ""Come Taste The Band" 35th Anniversary"
This is the final original DEEP PURPLE studio album of the EMI period to be remastered and features the Mark IV line-up featuring David Coverdale, Jon Lord, Ian Paice, Glenn Hughes and Tommy Bolin. The CD features the original album remastered on CD 1 and the whole album remixed by Kevin Shirley (Iron Maiden production supremo) on CD 2 along with 2 previously unreleased tracks. This classic album is also available as a remastered gatefold double vinyl LP. 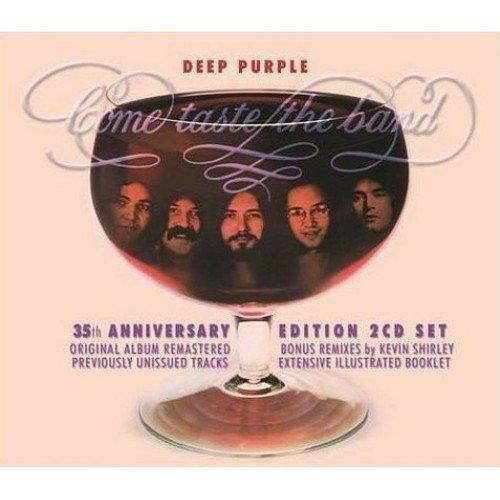 35th anniversary edition of “Come Taste The Band” will be released on 29th October. This is the classic EMI TV compilation of DEEP PURPLE from 1980 revamped for it's 30th anniversary to include tracks taking in Marks I and IV, not previously represented on the original album and a bonus DVD featuring TV performances, newly created clips and a new track by track interview with Jon Lord. The original “Deepest Purple” reached No.1 in the UK album chart in August 1980, displacing Queen’s “The Game”. It took a new release from AC/DC – an album called “Back In Black” – to cut short Deepest Purple’s tenure at the top. “Deepest Purple” was also PURPLE’s third No.1 album, after “Fireball” and “Machine Head”. Now, with this 30th anniversary edition, this juggernaut of a compilation has been supercharged for the 21st century. The “30th anniversary edition” of “Deepest Purple – The Very Best Of” will be released on 29th October.